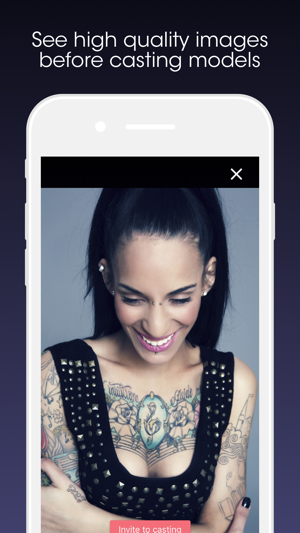 Model Now is the real-time modeling and castings app from modelmanagement.com showcasing top castings and modeling jobs in your area to kick start your modeling career! If you're a photographer or industry professional, search and cast from thousands of highly rated new faces, professional models, hostesses, real life people and everything in-between. Model Now from modelmanagement.com is the fastest growing modelling community and the only app you need for finding a modeling job or the perfect model for your shoot or project. Now you can love a models images on their profile if you're logged in. Tap on an photo to see it bigger and hit the love button to show your appreciation! Was able to create my profile in 5 minutes and start browsing castings in my area. Beautiful app, easy to use. Makes it quick and easy for me to find available talent. Model Mayhem is better simply because u can apply to more than 1 casting per month on their free account... this is just a way to get our money, I’ll be closing my account, I’m not waiting a whole month just to apply to a casting I might not get chosen for. That’s y I gave 1 star. Thanks for your feedback. Our app is currently limit free and you can apply to as many castings as you wish. We also have a team in place to ensure that every professional, client or brand who is posting a casting on our app or site are real and are not trying to trick models in any way. This is of the highest priority for us and gives new and professional models piece of mind that they can apply safely to castings.